This is a picture of Noah and Oliver. Oliver is a new rattie I obtained up north at a pet store called The Pet Advantage. I found them to be very clean and different than your average pet store you will find. Oliver is a 8 week old Himalayan rattie. I wanted a different rattie and I wanted more boys for my other ratties to play with. He is very sweet and I am told he is part hairless also. He is a great addition to our extended rattie family. This is Willow. I saved him from becoming snake food in a N.H. pet store. They made me very furious when they had their pet rat shelves empty and I found him and seven other siblings downstairs in the "feeders" area. NOT good. I took home Willow and three of his sisters. He is very calm, likes to cuddle and loves his new cage that the boys have now I purchased at Petsmart. This is Tornado. He was a boy that my kids wanted to keep from Amelia's litter. They liked his markings hence the name. 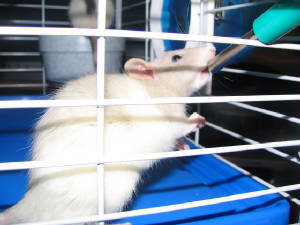 He is very sweet and loveable and adds a nice addition to our extended rattie family. This is Berlin. He is a tan self rattie who is very cute. We bought him on a trip to Burlington. I bought him at a Petco and was very sad as that was my first time ever in a Petco. I saw all ratties together that can mean only one thing. I had to bring him home. My boyfriend frowned on the idea as I had 10+ already at home and babies but I had to have him and couldn't leave him there. On the way home we tried names out and my boyfriend whom tolerates my rats but as he states, "doesn't care for them," named him for us. Berlin. Short for where he came from. 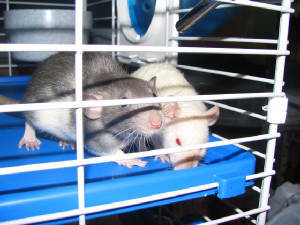 Could this be a start to my boyfriend's rattie friendliness? HMM. Time will tell. This is Zoey. I bought her and her brother, Willow and sisters, Clover and Katie at a petshop in N.H. I was horrified to see such a sweet animal in the reptile area due to an unwanted pregnant petstore rat situation. She licked me since day one and still licks me to death like a dog! She is the lickiest rat I own. She right now has kind of the run of things. I have my huge condo cage that she can get out of. I since reinforced only half the cage. Well, she is very smart and climbs to the top to get out. Well, she comes at 3:30 in the morning and plays with us in bed until she settles down. It is a ritual. She goes back into the big cage when she's ready. She is very well trained and so so smart. One of my new litters a boy BABY F is just like her. I will update pictures of Clover and Katie as I can get them. I also have kept two girls from Sabrina's litter, Mia and Nadia. I will update as soon as I get a pose.